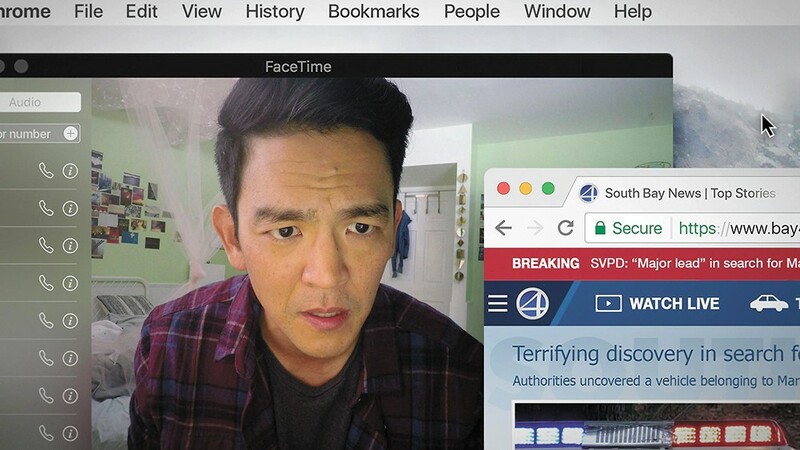 John Cho is a desperate dad in Searching, a 21st-century twist on your standard amateur detective story. It's a story that plays out entirely on computer screens: Skype calls, Google searches, YouTube videos. 2015's Unfriended told a teen paranormal-horror tale the same way. But Searching achieves what Unfriended didn't even attempt: With smarts and warmth and enormous humanity, first-time feature director and co-writer (with Sev Ohanian) Aneesh Chaganty has crafted an ode to the new digital lives we are all leading. There are no supernatural boogeymen here. There are elements to Searching's story that touch on real online pitfalls, such as the false intimacy that social media can offer. But there are joys to be found in our new digital lives, too, as well as myriad mundanities. And ironically — and unlike what can be said of most films offered up as entertainment — it is the mundanities that make Searching so special. This is ostensibly the story of how San Jose dad David (John Cho) goes about investigating the disappearance of his 16-year-old daughter, Margot (Michelle La). But before we even get to that, we get a charming introduction to this little family relayed entirely through the screens that document their lives. Where once we might have been treated to Super 8 or VHS home movies, or Instamatic or Polaroid snapshots, now we see someone creating a new user, on a desktop computer running an early-2000s version of Windows, for newborn Margot. All the childhood milestones of adorable little Margot are represented digitally, from pictures on the first day of school to MP4 files of her tween piano recitals. In the mix are similar digital artifacts that clue us in to the struggle of David's wife, Pamela (Sara Sohn), with cancer and her death a few years before now. Then we have the ordinary interactions between David and Margot, the texts and the FaceTime calls. Their relationship is sketched digitally, in a way that is all too familiar: With their busy lives — his job in some kind of tech, her school and piano lessons — it's easy for them to not physically see each other for days. Which is why it's more than a full 24 hours before David realizes that something bad has happened to Margot that is keeping her away from home. Or did she run away? That's the conclusion police detective Vick (Debra Messing) comes to after a collaboration with David that looks at Margot's life and movements, from her classmates who call her a bit of a loner, to her melancholy Instagram photos of lonely places, to the remote Google Maps location where her car was last caught on closed-circuit television. The tiny touches that Chaganty layers up aren't just about detective work but about how we use our devices and what they say about us. There's the Google document that David starts to keep track of what Margot's classmates know about the last day she was seen, which he is able to share digitally with Vick because, you know, that's a practicality of how we do things now, and it represents concrete action that is keeping David distracted from his frantic worry. But there's the poignant reality that David didn't have any contact info for Margot's friends; he has to go into his dead wife's old computer — running clunky old Windows, such a contrast to David's sleek new Mac desktop! — to find her very detailed information on, seemingly, every other child (and their parents!) that Margot ever had any connection to. It's simultaneously a reminder of Pamela's absence, a meta commentary on how fathers often get away with not being deeply involved in the minutiae of their own children's lives, and a smack in the face to David, who is coming to the startling conclusion — for other reasons, too — that perhaps he didn't know his daughter at all, and that this is his failing as a father. The original print version of this article was headlined "Unclear History"